Piazza della Signoria has been the political heart of the city from the Middle Ages to the present day. It is a singular urbanistic creation that began taking shape from 1268 onwards, when the Guelph party gained control of the city again and decided to raze the houses of their Ghibelline rivals to the ground. The first to be destroyed were the towers belonging to the Foraboschi and the Uberti families, in spite of the fact that the head of the family (the famous Farinata celebrated by Dante in his "Comedy"), had defended the city from destruction after its army had been disastrously defeated at the battle of Montaperti (September 4th 1260) by the Ghibelline coalition led by Siena. In the end 36 houses were demolished which explains the unusual "L" shape of the square and why the buildings around it are unaligned, all that remained after the city's enemies had all been "wiped out" (nothing was ever to be built on the site again). Its gets its name of course from the most important monument there, Palazzo della Signoria, designed by Arnolfo di Cambio in 1298-99 (much of it already completed by 1302, only three years later) for the seat of the Republican government and which was later to host the Gonfalonier of Justice and the Priors of the Arts (it was in fact at first called Palazzo dei Priori). The palace continued to maintain this politically representative function in the city during the reign of the Medici and later under Duke Cosimo I, who lived here between 1540 and 1565, commissioning his court architect, Giorgio Vasari, to double the building in size. 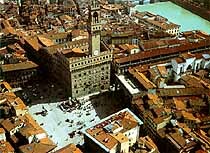 When the Grand Duke and his family moved to the new palace of Pitti in 1565, Palazzo della Signoria began to be known as Palazzo Vecchio (the Old Palace). The square however is not just the "civil" centre of Florence, it is also a splendid open-air museum. The square of the Uffizi stretches out on the south side, towards the Arno, with the eye-catching Loggia dei Lanzi, (1376-1382), whose late Gothic roof covers 15 statues which also include Benvenuto Cellini's wonderful Perseus holding up the head of the Medusa. 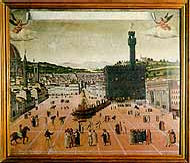 The square is bordered by a series of houses that date from the 14th-16th centuries, among them the Tribunal of the Mercanzia (1359, an ancient court of justice that dealt in commercial matters), and 16th century Palazzo Uguccioni, whose facade is thought to have been designed by Raphael. The palace containing the Alberto Della Ragione Collection, which the Genoan collector donated to the City Council (1970), stands at number 5. Its 21 rooms contain 250 Italian paintings from the period between 1910-1950. The huge palace of the Assicurazioni Generali, built in Renaissance style in 1871, stands on the sites of the ancient Loggia of the Pisans and the church of Santa Cecilia. Substantial remains of many of the buildings that stood here in antiquity were discovered when the square was repaved in 1980. This gave the Board of Architectural Assets the chance to study the remains of houses and the various stratifications in detail; the area was confirmed as being the site of the first human settlement, that grew up by the ford across the Arno, while the Neolithic remains that were discovered dated from long before the foundation of the Roman city. Moreover a great many remains of Roman Florence were found underneath the mediaeval houses, including some thermal baths and a workshop for the dying of cloth. The presence of this type of production shows that, long before the enormous development in the 12th-13th centuries that brought so much wealth to the "city of the Flower" and allowed it to finance all its artistic masterpieces, this activity was already playing an extremely important part in the history and economy of the city.